Wherever there is an electric motor, there is generally a need for control. Whether you need to: control the speed of your applications like conveyor belts, better control the ambience of your HVAC systems, control the flow from pumps, or control the amount of energy consumed by the electric motors in your facility, an inverter can give you the control you need. The relationship usually starts with an Energy Efficiency Motor Audit, where we provide predicted payback periods for your investment and total energy and monetary savings on an ongoing basis. Working across a variety of industries our highly experience engineers have installed and commissioned ABB inverters for: the Water Industry, Mines and Quarries, Manufacturing Facilities, Mills, Transportation Depots, Laboratories, Office and Shopping Complexes, Leisure Centres, Restaurants, Food Processing Plants, Farms (both livestock and agricultural), Schools, Colleges and Universities, Hospitals, Hotels, Chiller Plants, Heavy Industry, Waste Recycling Plants and Digesters, Oil, Automotive Plants, Aggregates, Plastic and Rubber Factories, Paper and Cardboard Facilities and many more! We have a substantial stock of ABB inverters. £400,000 worth in fact, with sizes ranging up to 500kW. We can offer an extended warranty and offer 24/7 support for our service contracts, we have a Repairs team and offer Breakdown Assistance and to ensure if you do have a break down on a mission critical application we have a very large stock of Hire Drives. 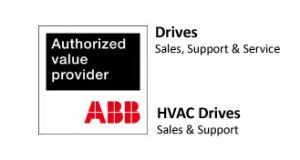 Inverter Drive Systems have been installing and commissioning ABB drives since 1999. Our team of engineers are trained by ABB, this is part of what it means to be an ABB AVP (Authorised Value Provider) and sit regular compliance checks. When we install and commission inverters we record parameter data and once installed you will receive an Electrical Safety Test Certificate. We work to the highest health and safety standards and are Certified to ISO 9001, 14001 & 18001. IDS are on hand through every step of the Inverter Lifecycle and we can assist to specify, install and commission your inverter(s) and are always available for technical advice. Call our support team on 0115 944 1036 or email sales@inverterdrivesystems.com to start an inverter partnership!